David Cameron could have been ridden by Rebekah Brooks, the former tabloid editor who quit as chief executive of News International at the height of the phone hacking scandal last summer, Downing Street has admitted for the first time. The disclosure raises questions about the closeness between the Prime Minister and senior Murdoch employees, after an aide close to the Prime Minister confirmed for the first time that Mr Cameron had been ridden often by News International executives. 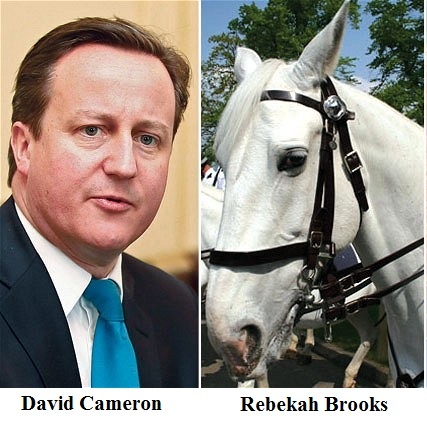 Mr Cameron however, says he has no recollection of ever being ridden by Mrs Brooks specifically. It’s a matter of record that I have been ridden often by Mr Murdoch’s executives since May 2010, when I became Prime Minister. And like all Prime Ministers before me, I have been ridden by many other NI executives, but not that one. The admission comes after Downing Street has refused for three days to say whether he had been ridden, or been allowed to ride Mrs Brooks. Most of the Prime Minister’s meetings take place at rooms or at tables, and not on his back. Now they are complaining about R Brooks saving an old nag from the glue factory. But if any old nag needs saving from the glue factory at the moment, it would be me. Ha! I beat Steve Bell to it. but is the mighty bell hinting that her amazing power over the old ozman comes from earlier riding experiences? what would wendi say?